Mudville Musings: Do I have enough for another ticket? Do I have enough for another ticket? 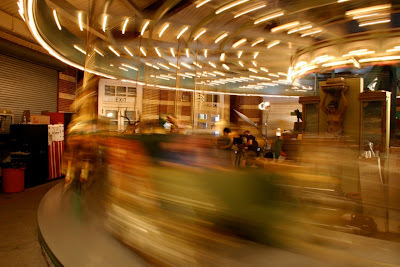 I think love like a carousel, goes round. Lord knows it has got it's ups and downs. those with no tickets, are left jealously glaring. It matters not which mount you ride. For love, indiscriminately, will abide. love mesmerizes with sights and song. you'll get your chance to feel sublime. and love will take you for a spin. and love will grace you with another spill. ejecting me earthbound with dizzy feeling. that I had even climbed aboard. What was I thinking? Why me, Lord? I realized why I had lost the lass. I wonder if I should dare ride again. Everything happens for a reason, I am thinking and yes it is always worth the dare. I do like how your babies enfold a story and also how disciplined you are with your words/your writings.You put me to shame Mister Pidasso!